Born in 1981 and grew up in a small town named Haps. We had to watch tv without cable, just an antenne helpt us to see a bit, while searching through the cosmos I first experienced noise. In the '90's I started to record music from radio stations and bought primary Michael Jackson records (now I have a huge collection). In 1997 I first heard real underground music and in 1998 I started to collect *core music. The cd that was titled 'Tunnel Of Terror II' changed my opinion on what music is all about.. In 2002 I had my first freeparty gig where I mixed some Epileptik and Lasse Steen kind of stuff there, but also some V/Vm, Speedranch and Speed Freak stuff. 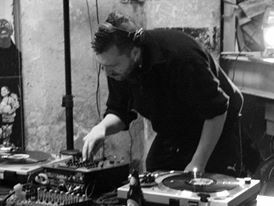 Since 2004 I got the chance to organise my own partys in Willemeen, Arnhem, where I also played sets at gabber partys, had the chance to do my first hip hop set in public, my crossover between speedcore and grindcore and my first blackmetal sets. In 2005 I could play my first breakcore set at a breakcore party series which later got the name Not Your Monkey Not Your Robot (my own organisation together with dj King Pin and Jorrit from the Goudvishal), later we became part of TK07. In 2006 I has some sort of breakthrough in the alternative gabber/teror scene with sets at SINAS (Doornroosje), Catscan I Magnify (Germany), Industrial Shock (Utrecht), Mayhem Outdoor and P.O.R.N. amongst others. That same year I was lucky to visit England and Eastern Germany when they booked me at Rigor Mortis, the Fuckparade afterparty and Böse organised by Saxy Speeddcore Force. In 2008 I got my first booking on Crack Beats, organised by Rioteer, who later became a good friend as well as in professional field. Also, my first visit to Austria, on a party organised by Eiterherd, and as well as the first time I could play at the demonstration parade Reclaim The Streets in Amsterdam. In 2009 I had my first gig at the Bevrijdigsdag Festival in Wageningen where we hosted our own area for the first time. This year I also played my first set at the Fuckparade. Since 2010 I'm a regular visitor of Berlin where I play at least 2 times a year since, the city has the greatest atmosphere and a serious underground scene with open minded audience. In 2010 our organisation TK07 also won a contest to have our own stage at the Q-Base festival, beside that we did the Bevrijdingsfestival again and late in the year in corporation with Crack Beats we had the Zhark vs Praxis labelnight in Arnhem. In 2011 I also became resident dj at the Wonderful Days events, where I play eurodace/rave sets under my alias DJ Hartpumper, where I found a new energy field. Through the years I played many underground styles as niches or as crossovers between each other, the music I play says something about my inner life and the things that are important for me. And I hope for you too..
Kamikaze · Mc Spike B-day!